Previously known as the PTLLS, the '7303' or Preparing to Teach in the Lifelong Learning Sector, the Level 3 Award in Education & Training was available as a Level 3 or Level 4 PTLLS (or PTTLS) course. Since it was revised in 2013 the Level 3 Award in Education and Training is now only available as a Level 3 teaching qualification. This Level 3 Award in Education and Training is the basic training course required for teaching or training anywhere in the public sector as well as the private training industry, FE colleges and HE institutions. Doing this Level 3 AET will qualify you to teach any course in your specilaist area so it is a great course to do if you want to teach up to Level 3 courses. 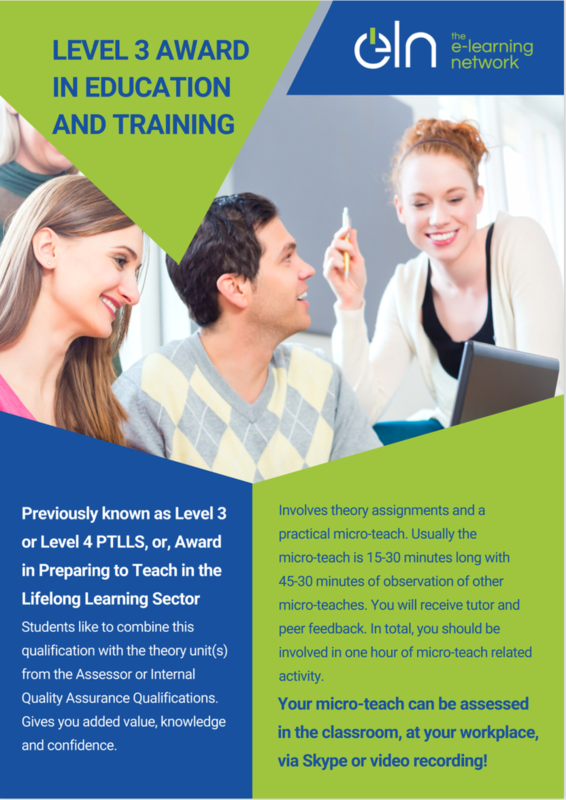 If the courses you want to teach are higher than Level 3 then please consider the Level 4 CET or the Level 5 DET. Find out about how people learn and how to make sure everyone participates in your classroom or audience. Interactive elearning environment and an e-portfolio system which is easy to use, no requirement to learn new software. In fact, we have had learners from other centres come to us to help them finish their Level 3 Award in Education and Training qualification because they did not get adequate support from their previous provider! If you are having the same difficulty contact us today and we'll do our best to help you right away! You will need to video record and send for assessment a 15-minute microteach session (your personal tutor will provide more details once you register). Compare the strengths and limitations of different assessment methods in relation to meeting individual learner needs. Explain how different assessment methods can be adapted to meet individual learner needs. 2 x essay style assignments, 1 x session plan, tutor feedback, peer feedback and self-evaluation. You will need to video record and send for assessment a 15-minute microteach session with at least 3 participants (your personal tutor will provide more details once you register). For any or all of these units we can use work based evidence if you already work as a teacher. Your tutor will discuss this in more detail before you start work on your Award in Education and Training.